Full of Gothic influence, this tapestry "Gothic Language" shows the work of artist Chiu Tak Hak whose art features in Germany, Paris, Hong Kong. Hak was born in Canton, China and has lived in Paris, France, since 1972. His works depict scenes of European buildings and his works have been shown in France, Germany, Hong Kong and the United States. 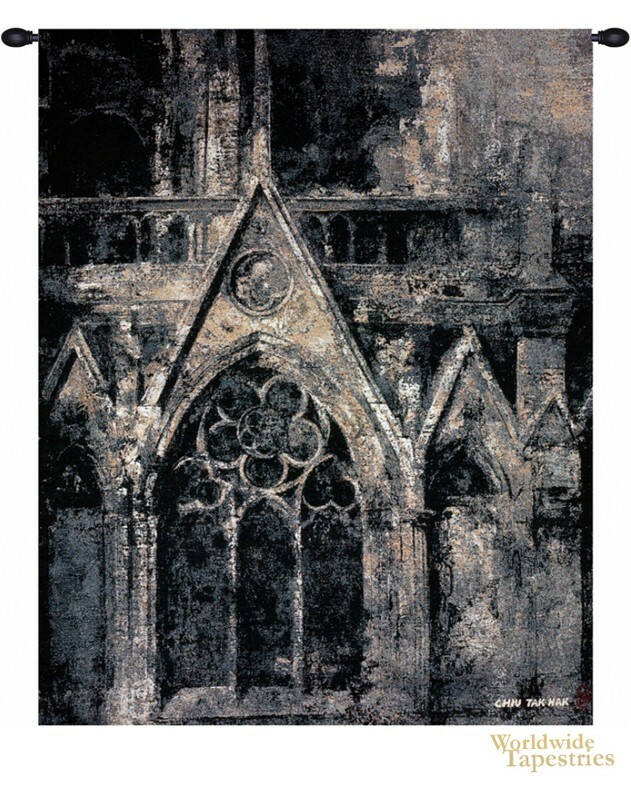 This tapestry shows a dark and gothic tone of a Gothic cathedral, with its gorgeous architectural motifs and stained glass windows. The mood here is exceptionally well captured by the smudge like play of light and dark on the building to accentuate the subject matter. In a work that has emphasis on light and dark, the contrast of the textures are even more keenly perceived by the eye. The works of Hok has a strong appeal to the senses as well as the imagination. This cityscape tapestry "Gothic Language" is backed with a lining and has a tunnel for ease of hanging. Note: Tapestry rods, where pictured, are not included in the price.